I’m sure you all remember Peggy and her earlier tutorials on how to make tights and a dress from a ladies knee sock. Well I’ve finally put together a tutorial that she sent me quite some time ago showing how she made a cute top and capri pants from ladies knee socks. In this blog Peggy shows how to make the Capri Pants with the contrasting trim and in a coming blog you’ll see how she made this sweet summer top. 1. For the bottoms I started with a solid colour sock and cut it just above the heel. 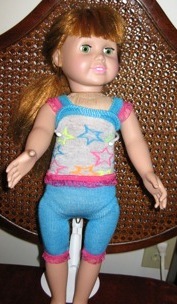 I then pulled it on the doll to find out where the crotch level would be and marked it with a pin. 2. Next I cut up the two sides as far as the pin level. 3. 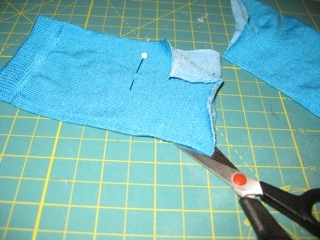 I then took some elastic that was edged with a ruffle and sewed a strip along the two bottom cut edges of the sock piece. NB. You could also use Fold over elastic or use some stretch fabric such as Lycra to make a contrasting trim if you don’t have the fancy frill elastic or Fold over elastic. 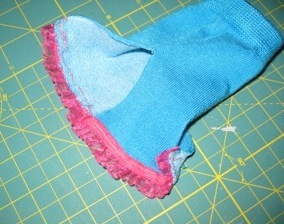 If the sock doesn’t need to stretch to go over the doll’s leg you could also use some lace. 4. 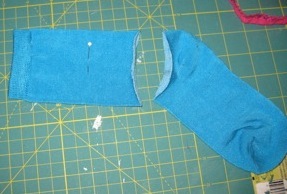 I turned the piece inside out and then pinned the inside leg portions. 5. 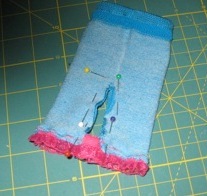 Next I sewed the leg seams with a stretch stitch or you could use a knit stitch or if your machine doesn’t have either of these stitches, use a zigzag stitch. 6. Turn pants to right side and voila! Thanks so much Peggy for sharing your creative ideas with us, this is super cute and so easy! I will share your tutorial on making the sweet summer top soon. Thanks so much for the tutorial, the granddaughters will love this for their dolls. Peggy is a clever lady. Now we can make use of the ‘one of’ left by the washing machine sock monster. Very cute. Thank you so much for sharing your gift of creativity! You are a blessing to so many. 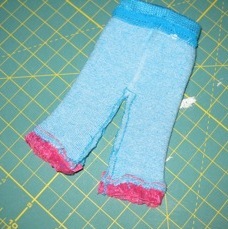 I just love how you can make doll clothes out of things that otherwise would be tossed out. We all have that one sock floating around. I never would have thought of genius idea ! thank you! I have been so busy all summer making Elsa (“Frozen”) gowns plus other AG items for a charity craft sale this coming November that I haven’t spent any time working on some new ideas for sewing with socks. I am thinking that I might try to do up something in a skirt with a ruffled or lettuce leaf edge. If I have time after I fill all the other orders for items people requested I will do up one and send it along to Rosie. I leave for Florida Oct.21 and won’t have access to a sewing machine until I get home next spring. I am “sooooooo” tempted to buy one for Florida but I know I will spend all my time at it while I am supposed to be relaxing and enjoying the sun. Then I will want to duplicate everything I have home here in my sewing room, serger and all. I guess I will just have to make do with more portable crafts when I am away from home. Thanks so much for all the compliments on my past sock creations. I will try to come up with something new this coming winter. Have any of you made winter caps out of fleece pyjamas? 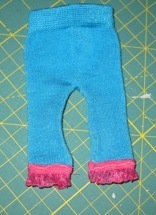 This is a no sew project that even the kids can do. If anyone is interested I will send Rosie the instructions.